-I will be using the existing carcasses: they’re in good structural shape, and that’s way too big of a challenge to take on. -Doors and drawers will have an overlay, not inset. Is 1/4” ply sufficient for the inset panels on both the drawer fronts and cabinet doors? I’m assuming that I would need to use something thicker to on the drawer fronts to eliminate the gap between the fronts and the drawer boxes. Also, design-wise, I’m using the bits I mentioned with a slight chamfer around the outside edges of the drawer fronts and doors. Thoughts on this? And on the drawer boxes, 1/2” or 5/8”? My original plan was to buy 6/4 maple and resaw to eliminate excessive waste, but is 5/8” overkill? Or is 1/2” more aesthetically pleasing? These will be made using half-blind dovetails in the front with my Porter Cable jig. Lastly, if I’m using 1/4” ply for the inset panel, my understanding is that painting the panels prior to assembly and using space balls is standard approach, correct? yeah 1/4 for shaker panels is fine i just did a dresser and used 1/4 on the drawers and doors,if needed just put a spacer where the handles go.for the drawer boxes i only use 1/2 but you can go thicker if you want just not needed.and yeah painting the panels first would be easier and space balls are great to prevent rattles.i love shaker style and have used it a lot because as you mentioned it’s timeless. When I use that bit set, I like to do a raised panel with a 45º bevel and back cut the rear to fit the groove. You can see it on the side panel of my vanity project below. I just like the full 3/4” panel since it’s more solid. When I build them with a flat panel at customer’s request, I use 1/2” stock and back cut 1/4” to fit. It’s up to you, but I don’t like the sound of thin panels on doors. If you do use ply, then spaceballs will prevent any rattling but aren’t necessary for seasonal movement of the panel. The chamfer is your call. Whatever you (and more importantly, the wife) like is the important thing. Finally, regarding the drawer box, 1/2” birch ply works well. If you want a little more upscale look, go with the maple. In the case of maple, I like to go 5/8”. When I use that bit set, I like to do a raised panel with a 45º bevel and back cut the rear to fit the groove. 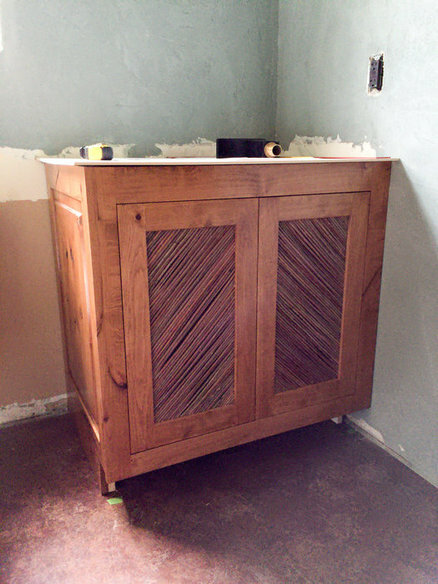 You can see it on the side panel of my vanity project below. I just like the full 3/4” panel since it s more solid. When I build them with a flat panel at customer s request, I use 1/2” stock and back cut 1/4” to fit. It s up to you, but I don t like the sound of thin panels on doors. If you do use ply, then spaceballs will prevent any rattling but aren t necessary for seasonal movement of the panel. The lack of a raised panel was a decision by the wife (though I’ll show her this picture and get her thoughts). In terms of using 1/2” stock to beef up the doors, would it be acceptable to use a good quality plywood, provided I prime/seal the edges? These are going to be finished with Target Coatings EM6500 White water-based lacquer, so I would think combined with sealing the edges I wouldn’t have to worry about the plys showing (especially since it’s the back of the door). The chamfer suggestion is really just to help soften the corners and add a touch more detail, but I’d likely forego it in the event that a raised panel is used, and simply ease the edges instead. And as for the drawers, I’ll stick with 5/8” then. I really love the look of maple, and was the reason I ordered the Blum undermounts, so I can enjoy the appearance unobstructed by slides. I do not like the “tinny” sound of 1/4” plywood panels. No offense to anyone, but it’s cheap sounding when the doors/cabinets open and close. I use 1/2” or 5/8” raised panels, turned around backwards for flat panels. It’s a much more solid door/drawer front. Use space balls in the grooves to prevent the from wiggling around when they shrink/swell. If you don’t want to use solid wood for the panels, and you are painting, you can use MDF for paint grade work. I use soft maple or poplar for painted panels. Paint all your panels before inserting them in drawers and doors. I make my rails/stiles from 7/8” finished stock. More solid look and feel. Once again, here’s your chance to achieve a custom, high end look. The only issue with using 1/2” ply for the door panels is to be sure that your back cut is only wide enough to allow the panel to seat in the groove. I’d go for around 1/8” to 1/16” reveal. Otherwise you’re going to be looking at the bare edge of the plywood. Granted, it’s on the inside, but from looking at your other fine projects, I suspect you’re going for a clean look. When I built cope and stick cabinet doors, that I then painted white, I glued the 1/4” ply panels into the frame on all 4 sides before painting. This keeps the panel from rattling and also makes the door stronger by making it one rigid structure. After 10 years, I have had zero issues with door warpage or unpainted edges of plywood panels showing. IMO, you will get a superior door gluing in the plywood panel than you will floating the panel. I think Rich and you have some overlapping advice. But the suggestion to use 7/8” rather than 3/4” finished stock was a new one to me. I might have to try that and see what I think. Though I think even 3/4” will be an upgrade at this point, as I’m fairly certain my existing doors fall under that. I appreciate the encouragement :D Maintaining an 1/8” reveal all around on the back seems pretty manageable, so I’ll likely take this approach. I know Jeff mentioned using MDF, and while I’m sure it’s suited to the task, I just really hate working with that stuff. Seems to generate more shop funk than anything else. Appreciate the suggestion, and while I wouldn’t doubt your personal success with the method you used, it does seem to buck conventional wisdom on cabinet assembly, and is certainly something I wouldn’t tempt here in the humid Ohio River Valley. I understand your apprehension regarding humidity. Minnesota summers are pretty humid, too (not as humid certainly) and winters are dry, dry, dry. I should clarify that I have used veneered 1/4” MDF for my painted door panels; MDF should be even more stable than plywood, and has the advantage of being a true 1/4”, making router bit set ups a bit easier. I have used this same construction for some friends’ kitchen cabinets, one set painted and one set shellaced, and they haven’t had any issues either. When I use plywood panels, I glue them in. They behave very different than solid wood panels, no need to worry about wood movement. Gluing them in makes a much more solid door and obviously you don’t need the space balls. I do think i’d use 1/2” plywood though. mnguy, Fred, I appreciate the follow-up’s. You’ve given me something to consider. And I’ll definitely be using 1/2”. The current doors use just a 1/4” inset panel, and they do indeed feel and sound cheap. Shameless bump to one of my old threads, but as I finish lining up my supplies for my kitchen cabinet makeover, I have a quick, hopefully easy, question regarding surface prep. I plan to clean the existing carcasses then sand with either 80 or 120 grit to clean up the surfaces and help with adhesion of the WB lacquer. I do, however, like the look of the “glass smooth” cabinets I’ve seen, and these old cabinets have slight gaps ( < 1/16”) and some dings. I’m assuming there’s something better to use than drywall putty to level out the surfaces? I’m looking for something that will spread easily, sand easily, and not want to crumble once the finish is applied.